My life has recently been enriched by two health apps. The work of Donna Haraway has enriched my understanding of why I like them, and why I don’t. Ella prompted me to think of them together. Hormone Horoscope is an app for people with regular menstrual cycles. It’s very simple and very effective. It takes the findings from lots of scientific studies into the menstrual cycle and its effects, and feeds them to you day-by-day. Each day it gives you a ‘horoscope’ with information about your likely mental and physical state on that day of your cycle. Babylon is a virtual GP. You book a video call with a GP, usually within an hour, do the consultation, and they email the prescription to a pharmacy of your choice. I have used it for minor ailments but I wouldn’t use it for anything more serious. It’s currently free but I will happily pay for it in future. 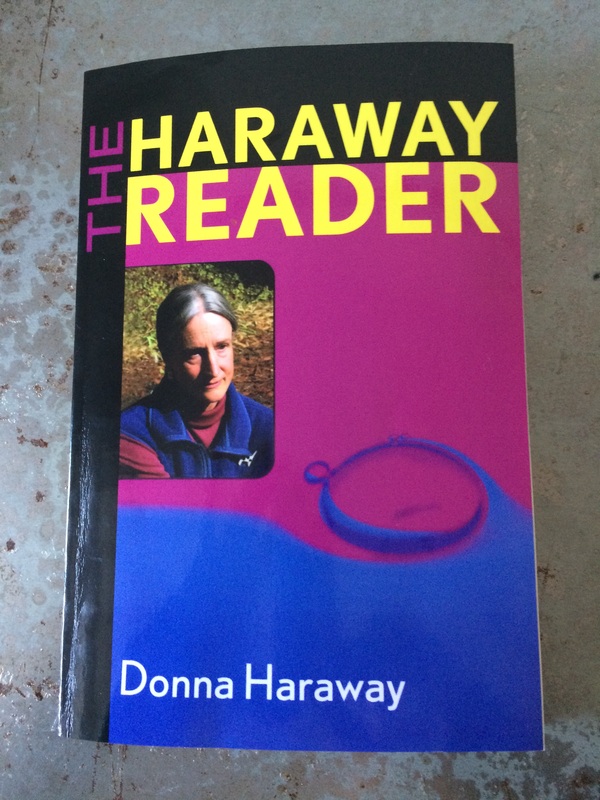 Donna Haraway is a feminist theorist of science and technology. Last weekend I re-read her essay A Cyborg Manifesto, which is probably her most famous work. One of the many arguments in A Cyborg Manifesto is to distrust binaries including the one between human and machine. Haraway makes this argument by writing about the concept of the cyborg. The essay is playful and complex. I have learned from A Cyborg Manifesto that a strict binary between human and machine is incorrect. At the most basic level this has the implication that us humans are constituted by technology, and technology is part of us, we don’t live outside it. But while I begrudgingly accept I’m probably a cyborg not a human (or at least might be in future, and that this might be a form of liberation), I don’t like the idea of having health apps collect lots of data about me. I know my iPhone already does this to an extent, and it gives me the creeps. I suppose this makes me a reluctant cyborg. A reason I like these two apps is because they use my input and combine it with other people’s existing scientific knowledge, which I would not otherwise have access to, rather than collecting data about me in the background and giving me the results, like lots of health apps. I like how all the medical knowledge Hormone Horoscope has about me is the start date and length of my menstrual cycle. I like that Babylon can link up with my medical records and update my regular GP with new information, or not. I like that it gives me better access to the medical profession, rather than collecting and analysing lots of information about me. Haraway teaches us to ground our experiences and critiques of science and technology in their social contexts. A Cyborg Manifesto takes aim at patriarchy and capitalism, among other oppressive systems. This reminds me that my previous paragraph makes these apps sound more innocent than they are. I am troubled by using private healthcare like this because I think excellent healthcare, including women’s healthcare, should be available on the NHS. I love Babylon because my GP’s surgery doesn’t give appointments quickly enough to be useful for short-term conditions, or conveniently enough to be accessible if you work. I love Hormone Horoscope because it makes scientific knowledge available in way that is meaningful for non-specialists, rather than leaving it in journals behind paywalls. They are both work-arounds for healthcare systems that don’t work for me. They are also exclusionary for various reasons. They are only available to people with expensive phones, internet access and particular skills. Hormone Horoscope is very pink, presumably because it’s aimed at cis women. I could go on but this post was meant to mainly be about why I like these apps. I’d like to write a sentence here that neatly resolves the conflict in me liking and disliking things at the same time but I can’t. I hope Haraway would approve.